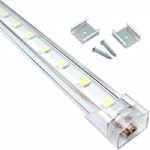 --- Designed with environmental responsibility in mind This environmentally responsible LED lighting system complies with RHHS standards and CE certification. It contains no lead, mercury or glass, so handling and disposal are less of a concern. With the range of CE, we have passed through EMC test, so you can apply the wall washer for your projects freely. In order to confirm the truth of our wall washer compared with some faked certification in other suppliers here, here we offer you authorized certified company Shenzhen BST Technology Co., Ltd with its website: www.bst-lab.com. You only open the link and input our Certificate Number, then you will get all details from us. 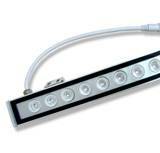 --- Diversity RGB series( Single RGB &RGB in one ) & single color series are available. And for RGB version, it is compactable with our RGB controller (JA-C6000) & it is also friendly enough to work with user´s own program if it is connected to a DMX controller; Lengths available with 600mm-1200mm, customs length available on request. --- Recyclable The wallwasher itself is designed with low working voltage 12VDC. Cause adapter is electronical expendable, it is more prone to damage compared with leds. So ours come with separated adapter instead of built-in adapter. In case the adapter goes wrong, just need to replace the faulty one.